Military style short dress featuring a overlay vest with golden applique. 3 recolorable areas, 3 color variations, custom Cas thumbnails, bump and mesh. 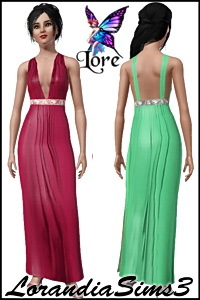 Flowers front strapless embroidered organza gown for your sims 3 female evening wardrobe. 2 recololorable areas, 3 color variations, CAS thumbnails. 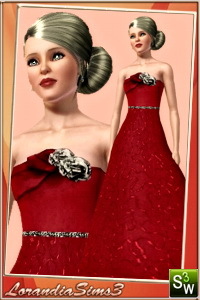 Belted formal dress for your sims3 female. 3 color variations, custom CAS thumbnails in the same pack. 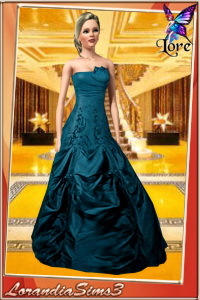 Beautiful evening dress. 2 recolorable areas, 3 color variations in the same pack and custom CAS thumbnails. 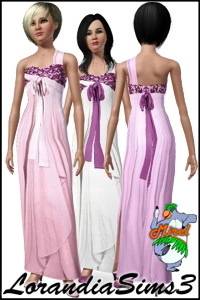 One shouldered organza evening dress featuring rhinestone bust area, organza silk fabrics, front and back tie. 3 color in different areas.